Roswell "alien". 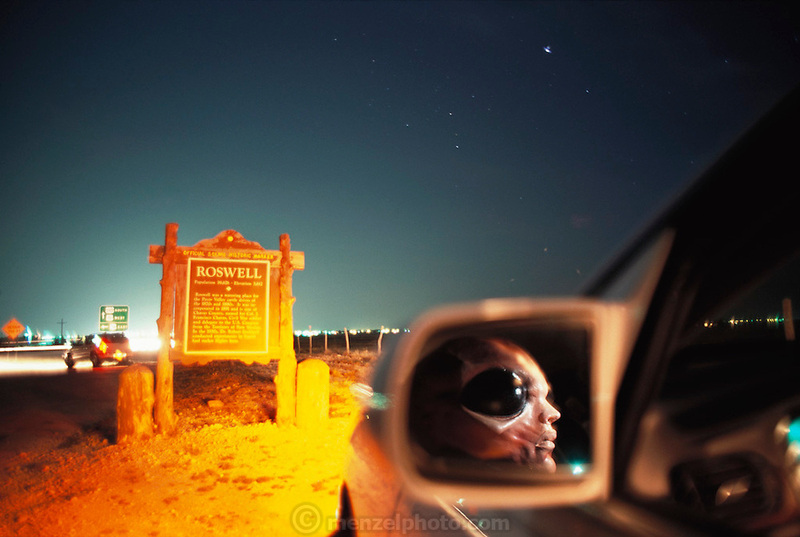 An alien face seen in the mirror of a car at night on the outskirts of the town of Roswell, New Mexico, USA. It was near Roswell on the evening of 2 July 1947 that many UFO sightings were reported during a thunderstorm. Next morning a rancher, Mac Brazel, discovered strange wreckage in a field. When the impact site was located, a UFO craft and alien bodies were allegedly found. On 8 July 1947, the Roswell Daily Record announced the capture of a flying saucer. The official explanation was that it was a crashed weather balloon. Many Roswell inhabitants, however, believe this a cover up, and Roswell has become a symbol for UFO enthusiasts. Photo illustration. (1997) .